To download the full policy brief in English, click here. A new Taub Center study, published to mark the occasion of International Women’s Day, compares employment among women and the employment rights of parents following childbirth in Israel and the OECD. In recent decades, there has been an increase in employment rates among women – particularly among mothers with young children. With regard to payment rate and length of paid leave over a woman’s lifetime, Israel performs better or similar to that of other OECD countries. However, when it comes to leave benefits for men and the design of parental leave benefits, Israel could learn from its OECD colleagues. 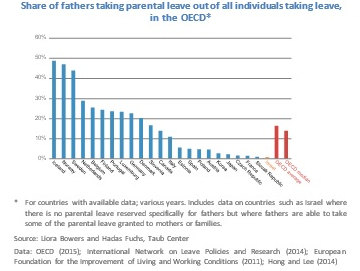 Israel is one of only five OECD countries that do not grant any parental leave specifically to fathers. As a result, only 0.4% of individuals taking parental leave in Israel are men (the lowest percentage among 24 OECD countries) compared to an average of 16% in other OECD countries. Many OECD countries allow parents to use their parental leave benefits on a part-time basis, and a number of countries require employers to allow parents to reduce their working hours. Most OECD countries only pay a portion of the parent’s monthly salary during the paid maternity leave period – unlike Israel, which grants 100% salary replacement. In 1995, only about half of women aged 30-40 with children ages 0-4 were employed, while in 2011, the figure rose to 69%. Today, the employment rate among women with young children is almost as high as that of women without young children. To align with the OECD, Israel would need to grant fathers 10 days of paid leave following the birth of a child, provide one standard unpaid parental leave benefit of six months, and allow the use of parental leave benefits via a return to work on a part-time basis. A new Taub Center study by Director of Policy Liora Bowers and Researcher Hadas Fuchs shows that Israeli women are employed at relatively high rates: in 2014, the employment rate of Israeli women was 7 percentage points higher than that of women in the OECD. The employment figures among Israeli women are improving over time: in 2014, the employment rate of female Israelis aged 25-54 stood at 74% – an increase of 20 percentage points from 1990. 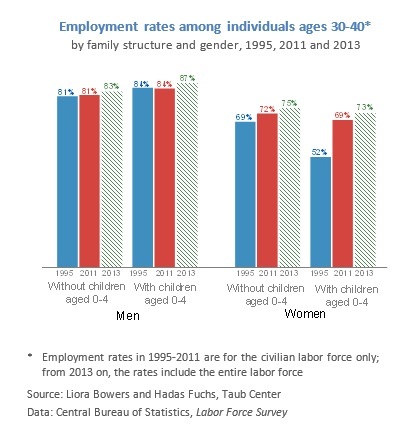 Among Jews in this age group, employment rates of men and women are nearly identical. About 34% of employed women work part-time, with half of such women citing that caring for their children is the main reason for their limited employment. Despite the increase in the share of women employed, there remains a 14% gap in hourly wages between men and women, similar to the average in OECD countries. According to Bowers and Fuchs, most of the increase in female employment was recorded among mothers of young children, particularly those without an academic degree. In 1995, only about half of women aged 30-40 with children ages 0-4 were employed, while in 2011, the figure rose to 69%. By comparison, among men aged 30-40 who were fathers of young children, there was no change in employment rates between 1995 and 2011, with 84% employed in both periods. The employment rate for mothers of children aged 0-4 who have an academic degree increased from 78% in 1995 to 84% in 2011, while the increase in employment among women without a university education was greater: from 47% in 1995 to 57% in 2011. In 2015, this figure stood at 61%. In general, Israeli society – in terms of culture and government policy – encourages both fertility and women’s labor market participation. Government policies include job protection during pregnancy and for up to one year after birth, 100% of salary replacement during the months of paid maternity leave, and a one hour paid reduction in working hours during the four months following maternity leave. However, in some areas, there is a gap between Israel’s policies towards parents and the policies of other OECD countries. While in Israel, it is possible for both parents to share in the parental leave granted, in practice, policy does not encourage this division. 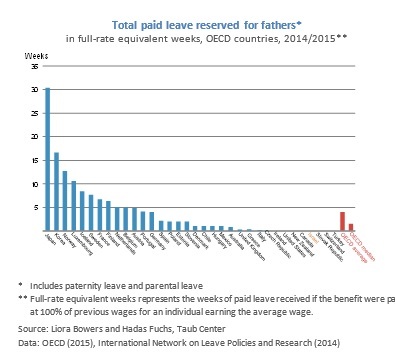 Bowers and Fuchs’ study shows that 20 OECD countries provide paid (partial or full) paternity leave for fathers immediately after birth, and about 75% of fathers take advantage of this benefit. By contrast, Israel does not give any paid paternity leave to fathers. Another benefit which promotes equality between parents in the OECD is granted during a child’s early years. There are 13 countries that provide some paid parental leave that is specifically allocated to fathers. The results of this policy are seen in the share of men who take advantage of such leave. On average, 16% of individuals taking some leave to care for a child in the OECD are men, compared with only 0.4% in Israel. In Germany, for example, the introduction of a policy which granted two months’ extra paid leave on condition that the father actually takes this leave catapulted the share of fathers who chose to stay home with their baby from 3% in 2003 to 29% in 2012. In Iceland and Norway, nearly half of individuals taking advantage of parental leave are men. The Taub Center study by Bowers and Fuchs is the first to compare the total period of leave granted to mothers over their lifetime, rather than the length of leave given per birth. Fertility rates in Israel are higher than those in the OECD (an average of 3 children per woman in Israel, compared with 1.7 on average in the OECD). As such, it is more costly for the country to provide for the same length of maternity leave per child (paid and unpaid), because of the financial cost to the state and the impact on the broader economy. When comparing the length of maternity leave throughout a woman’s lifetime that is granted at the equivalent of her full salary, Israel is close to the OECD average: 42 weeks of full salary equivalent compared to 44 in the OECD. Israel’s figure is higher than that of 19 other OECD countries. The situation in Israel is better than that in the OECD in one important area. Israel is generous in its maternity leave payment, granting 100% of the mother’s wage during the paid leave, up to a ceiling of NIS 1,460 per day. In families where the father takes some of the leave, the benefit is also paid at 100% of his salary – even though generally the wages of men are higher. By contrast, in 21 OECD countries, leave is paid out at only a portion of one’s salary for those earning an average salary – that is, in most OECD countries, although maternity leave is longer, women receive less than their full salary. One important area in which Israel differs from the OECD is with regard to unpaid leave. In Israel, a woman is eligible for 12 weeks of unpaid maternity leave following the 14 weeks of paid leave. Afterwards, one can take “leave without pay” for up to a quarter of the length of employment with a particular employer, up to a maximum of one year. However, this benefit is not well known and only 12% of women take more than a total of six months of leave per child. 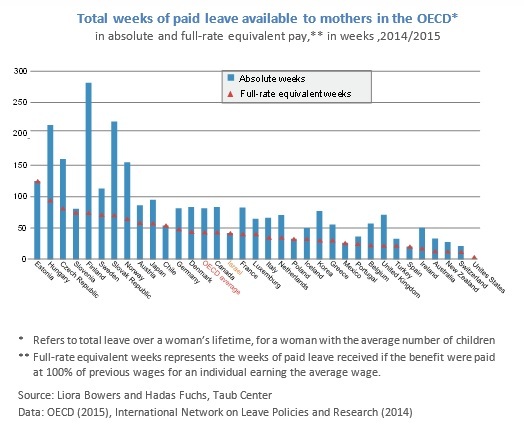 In other OECD countries, the common practice is to give any woman who has worked over 12 months for an employer the full leave benefits – and to explicitly call it “parental leave.” According to the Taub Center study, an Israeli mother with full benefits and the average number of children is entitled to paid and unpaid leave of 200 weeks over her lifetime, in comparison to 127 weeks in the OECD on average. As such, to align with the OECD, Israel would need to simplify the existing unpaid leave system, combining the two benefits (the 12 weeks of maternity leave and the additional “leave without pay” of one-quarter the length of employment) into one six month leave under the name “parental leave” and granting this benefit to any woman who has worked at least 12 months for their current employer. The return to work following childbirth is a period of major transition for families. The Taub Center study shows that various countries provide flexibility in the transition back from parental leave and into the labor market. These steps include allowing for a reduction in working hours and in general, flexibility for employees in hours worked and the location from which the employee may work. Various OECD countries allow parents to use their parental leave benefits in several intervals during their child’s first years, rather than only immediately after maternity leave. In Austria, for example, each parent can postpone up to 13 weeks of leave to take until a child is seven years old. Doing the same in Israel may help women return to the workplace sooner after maternity leave – promoting labor market continuity for mothers and allowing parents to leave to be with their children later on, for example, during the long school and daycare vacation in August. About half of OECD countries allow parents to return to work gradually – by utilizing parental leave benefits to return to work on a part-time basis. In addition, more than half the countries require employers to allow parents of young children to work part-time. In most such countries, the worker also has the right to return to full-time employment when they request to do so. Allow parents to use some of the leave currently granted by the law (e.g., the 12 weeks without pay) to return to work part-time – and extend the period of leave in proportion to the scope of the position. Thus, if a parent previously working full-time chooses to return to work at a 60% position, she can do so for a total of 30 weeks.